Come take a tour of our porch, dining room, breakfast nook & guest bedroom all decorated for Autumn! I’m taking a lighter, more romantic approach to Fall decor this year, and I hope you enjoy it and find some unique inspiration for your own decorating this season. I love both Summer and Fall, but I think Fall takes the lead for my favourite season of all because it always brings lots of fun, new adventures. My girls just started a new school year, and my birthday is this month. I also love Autumn because I get to start pulling out all of the cozy decor items that I love to combat the crispness that comes with the season – wooly blankets, fluffy pillows, soft candles, and luxurious textiles like velvets and furs. Today, I’m sharing our porch, dining room, breakfast nook and guest bedroom decorated for Fall. Come along with me as I show you how I’ve used my favourite furniture and accessories from The Brick to make our home feel cozy and ready for a fresh start to the season. This tour is part of the Fall Canadian Bloggers Home Tour hop that’s hosted by Shannon of Home Made Lovely and myself. Make sure to check out all of the beautiful Autumn home tours happening this week by visiting the links at the bottom of this post. 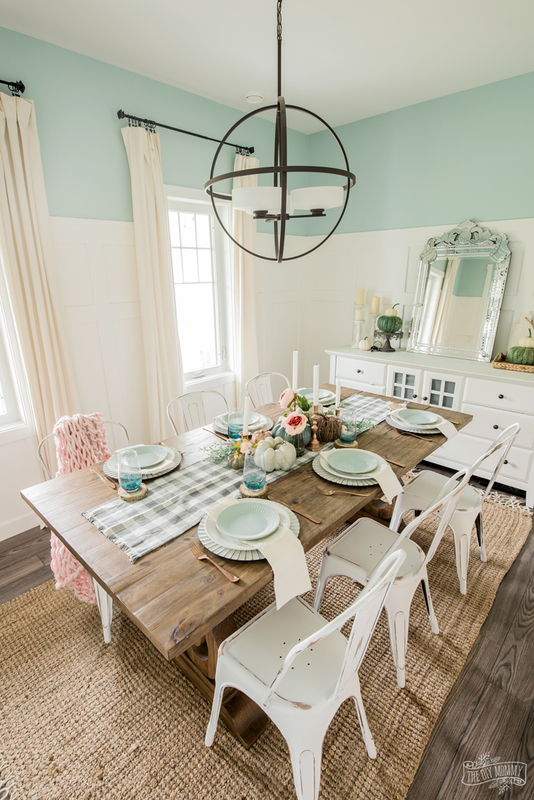 There are so many beautiful decorating ideas, and a style for everyone! 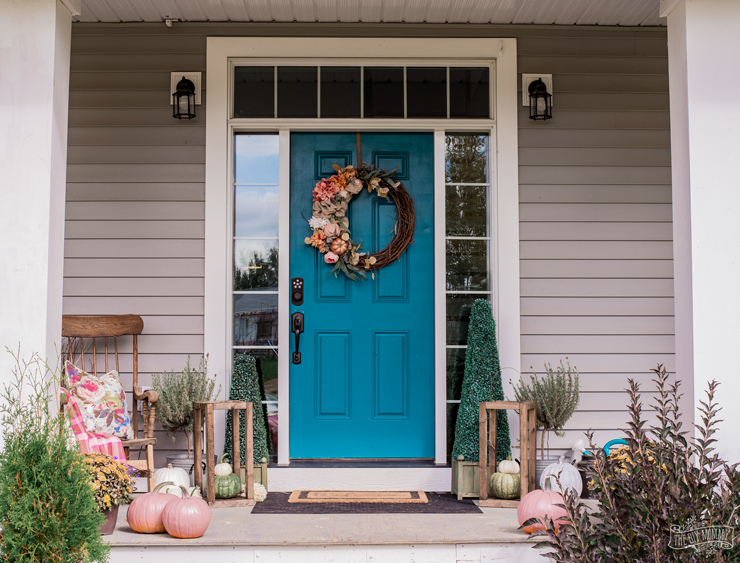 For our Fall porch this year, I used lots of natural elements to create a budget-friendly but beautiful entry. I love these beautiful faux boxwood topiaries I found at The Brick in store last year because you can use them for any season. They’re a great base for so many outdoor looks! Some DIY wooden lanterns (find that tutorial here), potted mums and pumpkins from our local pumpkin farm make this space feel seasonal and warm. I like to keep our outdoor seating area cozy for cool Fall days, and some fluffy pillows from The Brick along with more pumpkins and faux flowers make this space look instantly warm and Fall-ready. Our comfy outdoor sectional is from The Brick a couple of years ago, and we still love it! You can find a couple of similar outdoor sectional sets right here. Because it’s the first room you see when you enter our home, I wanted to make our dining room look extra welcoming and seasonal. I decided to paint our metal dining chairs white and distress them (they’re from The Brick last year) to help them blend into the rest of the room and make our Keswick Dining Table really stand out! Keeping the chairs, wall trim and carpet neutral makes the gorgeous warm wood of this table really pop, and the scrolling detail on its legs even more spectacular looking. This will be one of a few table setting ideas I’ll share with you this Fall, and this one is really subtle and romantic. 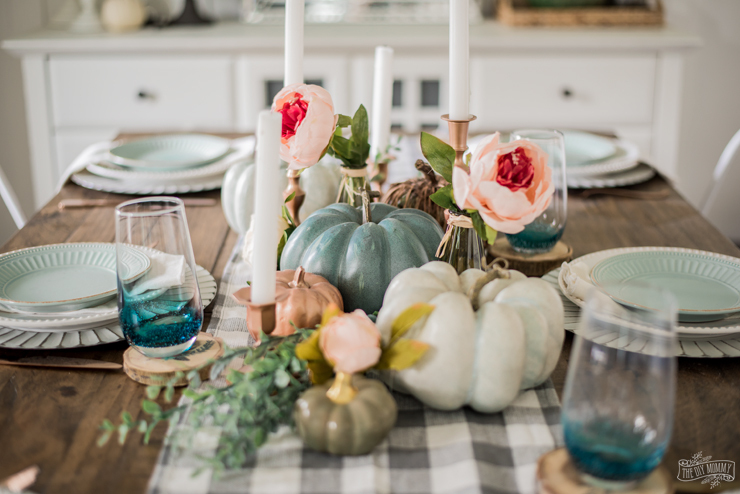 I used a simple plaid table runner as a base, and used some faux pumpkins, flowers, greenery and candlesticks I had on hand to create a soft centerpiece. Keeping the plates, chargers, candles and drapes light in tone makes for a very understated but elegant twist on a Fall tablescape. On the buffet cupboard, a few real pumpkins I found at the local pumpkin patch add some whimsy to the otherwise simple decor here. I love how our Mansard Mirror from The Brick catches the light and makes this space even more bright and magical looking! 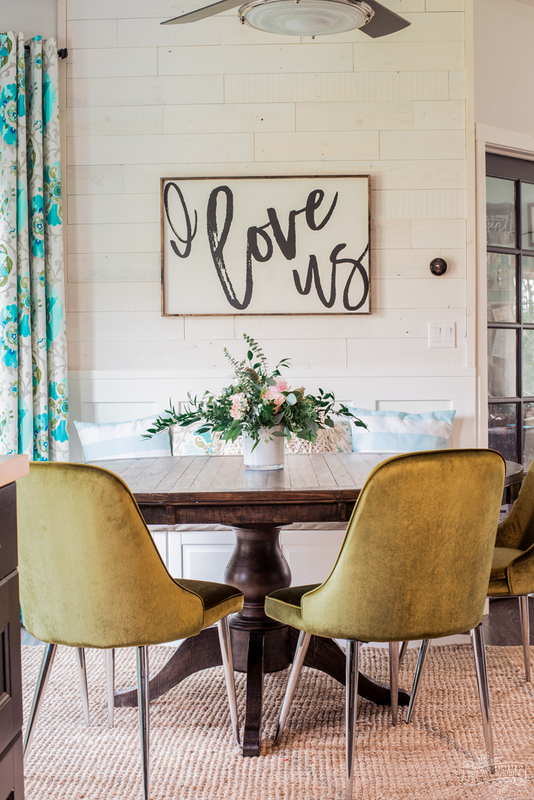 A quick swap of art and a fresh, floral bouquet gives our breakfast nook a simple update for Fall. I’ll share another Autumn tablescape idea on our round Trudell Table here soon, but I really adore how our new velvet chairs give this nook a pop of colour, and the texture and tone of these chairs is so perfect for the season! 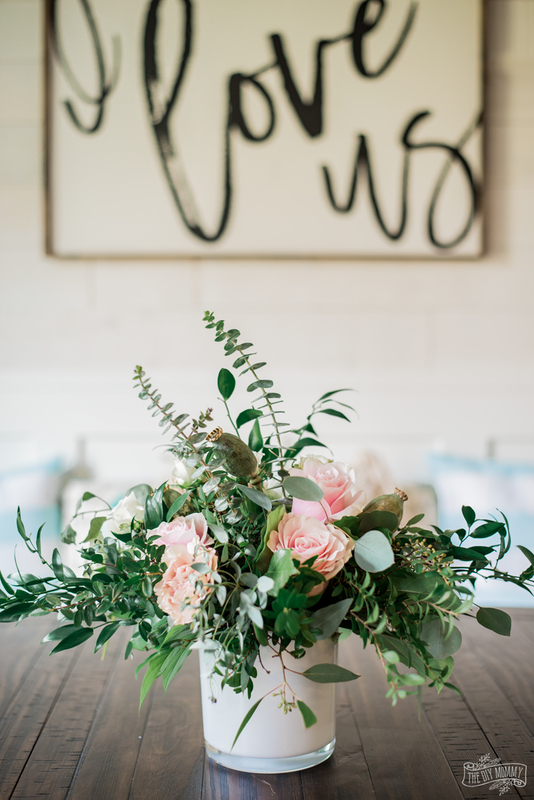 As much as I love decorating with faux flowers and greenery to save some money, there’s nothing like a fresh bouquet of flowers, is there? And look how pretty the blush pink & green of this bouquet looks with the deep walnut colour of our table? I love this colour combo for Fall! Our guest bedroom has recently been finished, and I love it so much! Its romantic vibe matches with all the rest of my Fall decor ideas this year, so I had to give it a little seasonal touch, too. I used a faux boxwood & pinecone garland I had on hand to decorate our Oslo Headboard. The headboard itself makes me think of Fall with its cozy & textured upholstery and tufting. 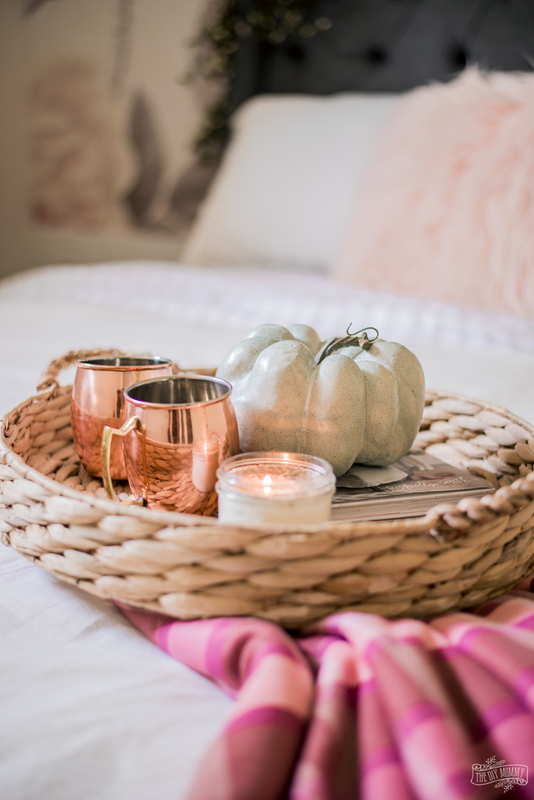 A cozy plaid blanket and a woven basket with copper mugs, a DIY candle and a faux pumpkin make this room feel ready for Fall guests. The finishing touches? 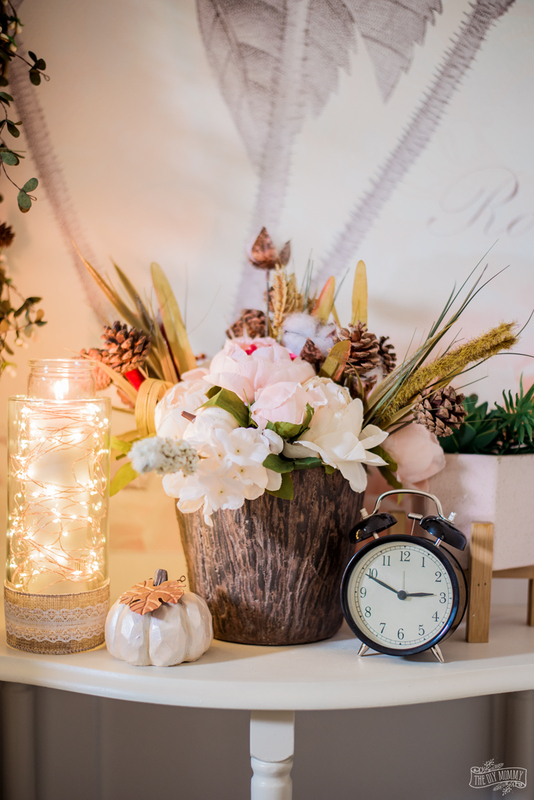 A DIY luminary I made with twinkle lights, a little faux pumpkin, and a autumnal floral arrangement on the nightstand add to this cozy guest space. I’ll be sharing some more of our home decorated for Fall later in the season, and I’m especially excited for a living room makeover coming soon in partnership with The Brick! I think you’ll fall in love with the new sofa that’s coming as much as I have; it’s going to be perfect for the cooler months. Can you guess what kind of luxurious, soft fabric its upholstered with? 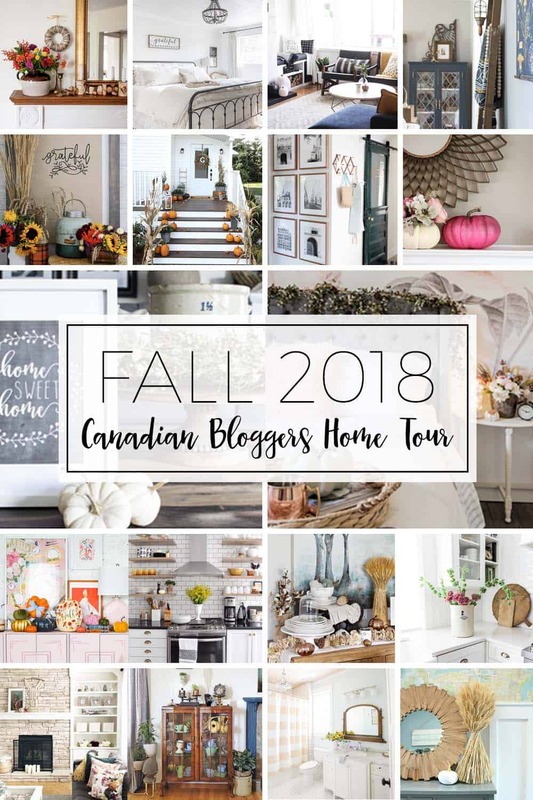 Now it’s time to tour all of the other beautiful homes in the Fall Canadian Bloggers Home Tour hop this season! Click on the links below from Tuesday – Friday this week to get tons of Fall decor inspiration from my Canadian blogging friends. Your dining room table from the Brick. Can you comfortably sit ten people. And sitting at the ends, is there enough leg room as the table leg is quite large. Hi Debbie, There are two leaves so when I add those, we can sit 12 people comfortably on the table including one comfortably on each end. It’s perfect for larger dinners! Thank you, seriously considering purchasing this table and it’s currently on sale. I love how everything looks so fresh and so clean and still perfectly “fall”. Not an easy thing to pull off! Plus, who knew the Brick had so many great things? So many subtle beautiful elements! That wall mural in your guest bedroom is amazing!! I love the colors you chose! The pink is not a typical fall color, but it really works! 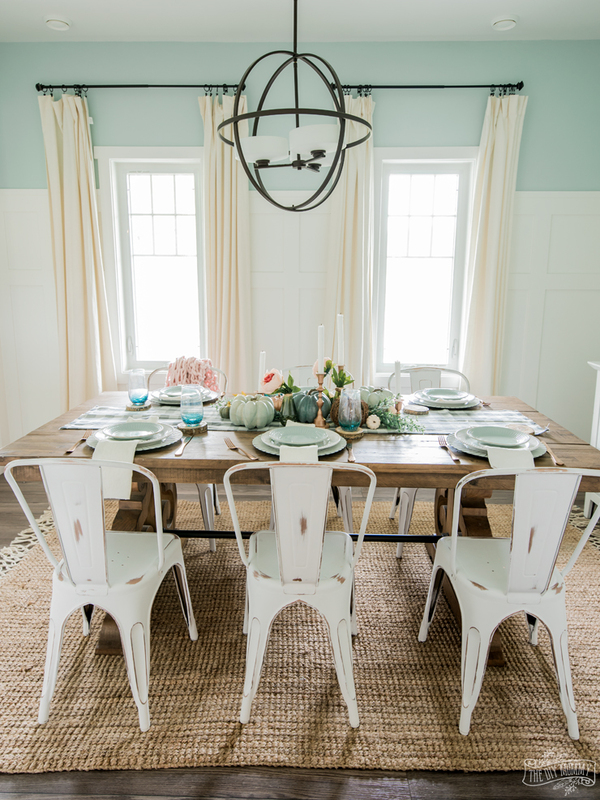 Love your dining room table and those painted chairs look perfect! I also really need to have a nap in your guest room – so pretty and calming. Everything looks so great for fall. I think my fav is the cozy spare bedroom -that wallpaper! 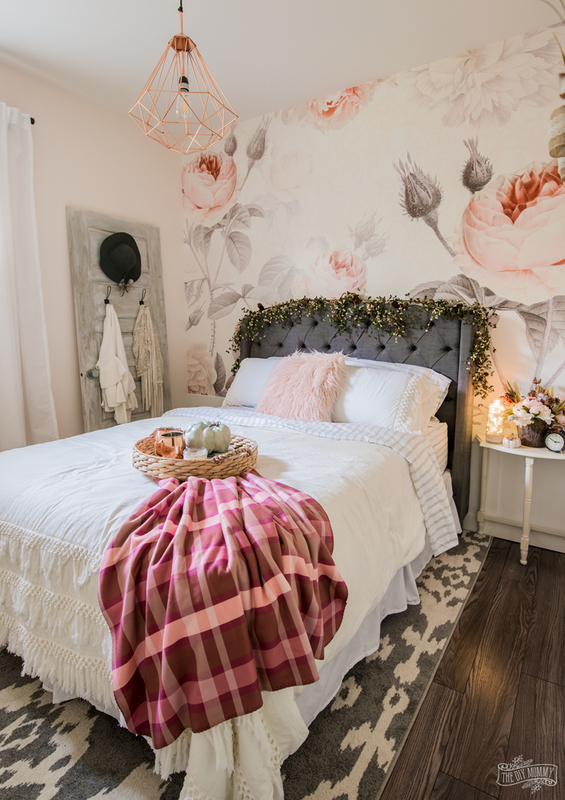 Your guest room is so pretty, Christina! I love that wall and beautiful headboard! Every room looks SO cozy and inviting Christina! 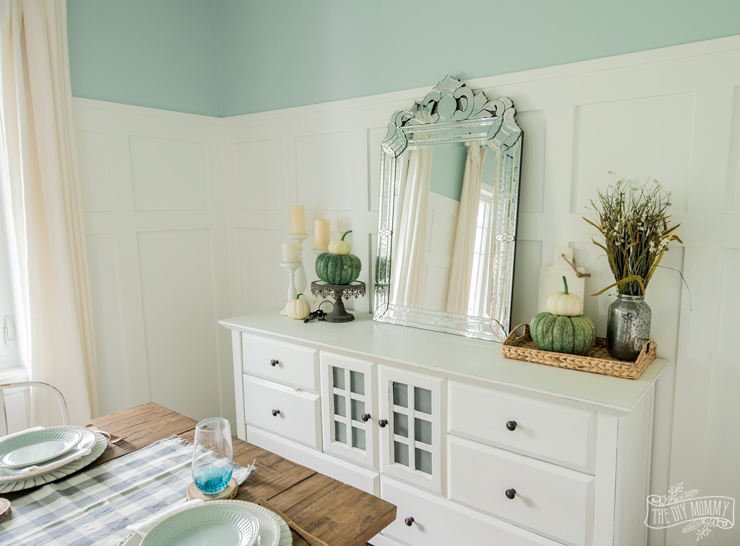 Love, love, love the soft, non-traditional colours you used in each space! Just want to say: “Amazing decoration”. Nice blog and keep up the good work! I L O V E your colour scheme this year! So gorgeous and fresh! Love the colors you’ve used my friend! Your fall home is so beautiful Christina! 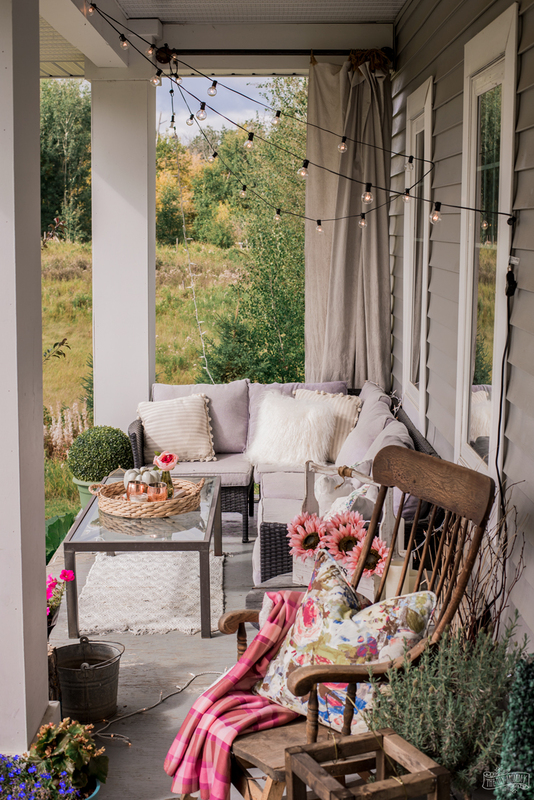 I LOVE all the pink touches and the soft grey pumpkins…and your porch is AMAZING! I love how you went away from the traditional “fall colours”- it’s so fresh and fun, but still warm and cozy! Beautiful Christina! 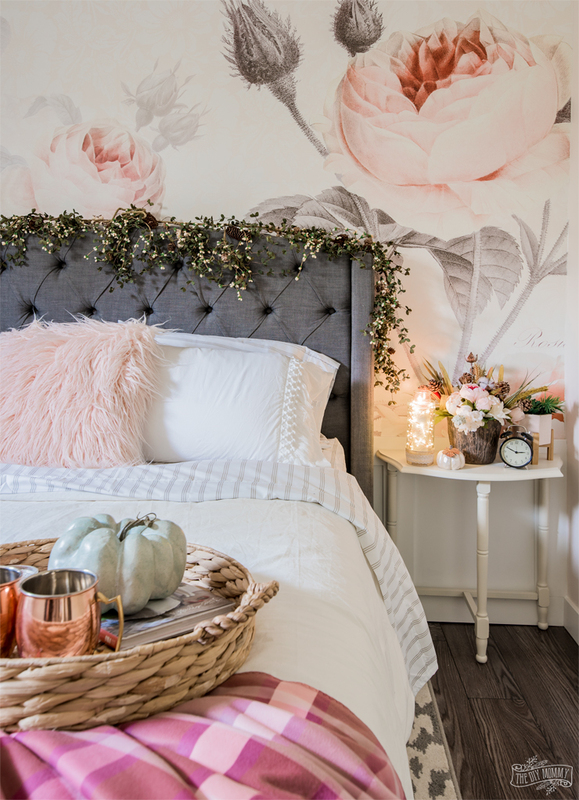 I adore the pink touches you incorporated into you fall decor. Love how cozy every room is, especially your gorgeous porch. Thank you for sharing at The Creative Circle link party. Hope you share with us again soon. I think your guest room is my new favorite place in your home! The mural is fab, and all the warm hues are exactly what I think of for fall. Thanks for including me in another fab tour!